While American country music stars were household names in Australia, the powerful songs from Aboriginal country musicians were being played out of earshot of the mainstream radio waves. 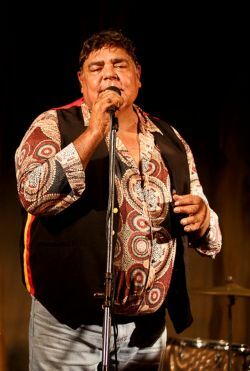 The story behind Aboriginal country music will pay tribute to the forefathers of the genre in a special stage production of Buried Country to kick off Darwin Festival. “It’s based on Aboriginal musicians in the early years and the song writers and our struggles,” Knox says. Knox grew up in Toomelah Aboriginal Mission on the NSW/Queensland border to the sounds of gospel tunes. He was introduced to country music when his family members would visit with their guitars in tow. “I didn’t hear Slim Dusty songs sung by Slim Dusty – I heard my cousins sing them." Music became a way for Aboriginal people to share their stories, which were unrecognised at the time. Songs like Bob Randall’s ‘Brown Skin Baby’ spoke of forced removal of light-skinned babies long before there was national attention and outrage about the Stolen Generations. Buried Country began as a book and film by Clinton Walker in 2000, and was adapted for the stage in 2016. Knox says he believes one of the reasons the story has been so successful is not just because there’s great music and powerful stories, but because it taps into an unappreciated and unknown part of Australian history. “People come not knowing the story and go away with a better feeling and understanding,” he says.